For enquiries and bookings - call us today!! We use Bellyflops for all our charity events and private parties.They have proved to be 100% reliable and a pleasure to deal with.Highly recommended. Hired a number of inflatables for my sons 6th Birthday Party. Firstly communication was absolutely fantastic.. despite several mind changes (on my part) and lots of questions nothing was too much trouble, replies were always prompt, friendly and informative. Delivery guys were also great. They were even already setting up early when I arrived to the venue. All inflatables were a HUGE hit with 45+ very happy children! Would without question recommend and will definitely be using again! Great value for money. Thanks Ken and team for helping to make it such a special day for my boy! Brilliant service, great bouncy castle, the people were very polite when delivering and picking up the bouncy castle. Very professional. I will definitely be using bellyflops entertainment again and will recommend to all friends and family. 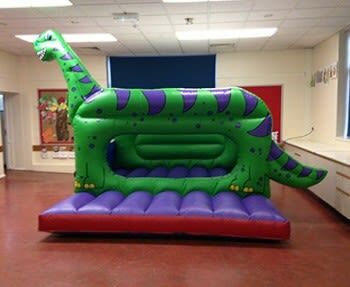 10ft x 12ft Dinosaur Castle. For under 6's, totally enclosed so little ones don't climb over the sides. Bellyflops Entertainment Hire © 2018. All Rights Reserved.